An attractive four bedroom detached house tucked away in a small close on a popular residential development. This wonderful family home enjoys spacious living accommodation including an impressive open plan kitchen/diner with patio doors leading out onto the garden. 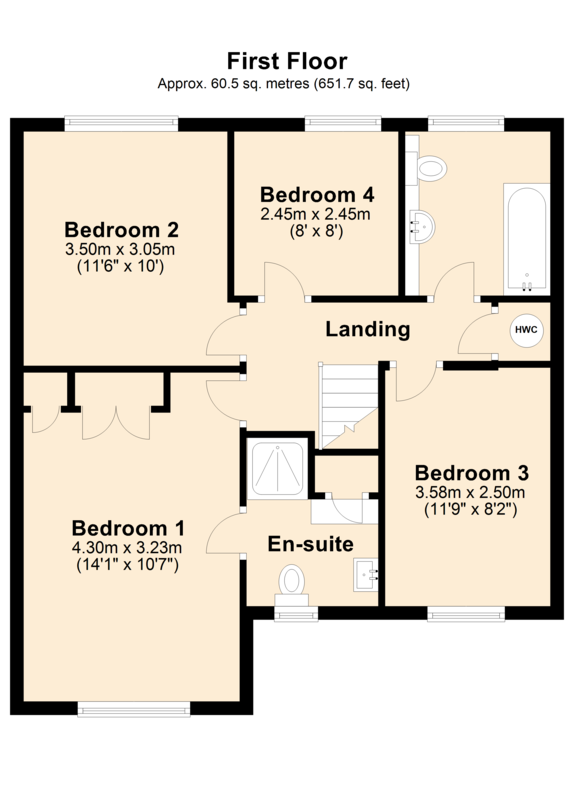 There is also a large master bedroom with en-suite shower room, stylish bathroom, utility room, light and airy living room, integral garage and large garden. ENTRANCE HALL: Radiator, coved and smooth plastered ceiling with smoke detector and understairs cupboard. SITTING ROOM: 16’6” x 10’7” Attractive fireplace with fitted gas fire, dual aspect windows to front and side aspects, coved and smooth plastered ceiling, wall light points and vertical radiator. 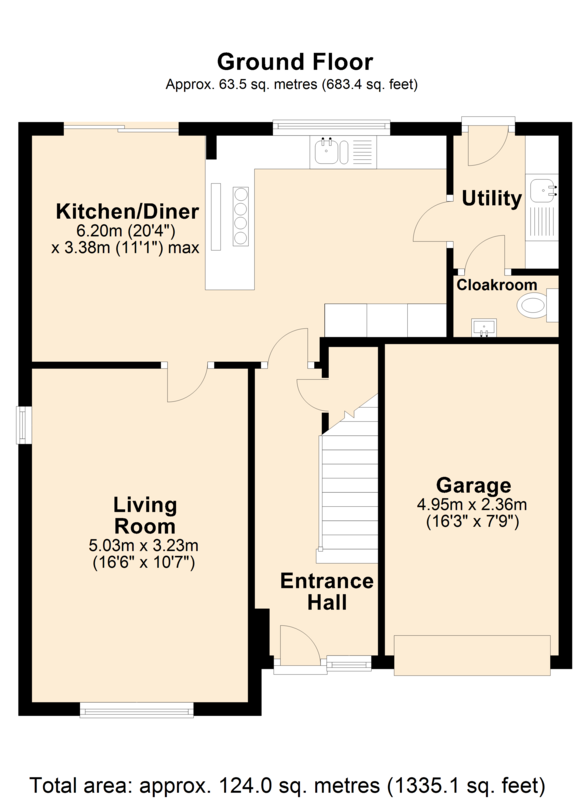 KITCHEN/DINER: 20’4” x 11’1” (narrowing to 10’) This is a particular feature providing a wonderfully social area with sliding doors giving access to the rear garden ideal for al fresco dining and entertaining. Inset 1 1/4 bowl single drainer stainless steel sink unit with cupboard below, further range of matching cream gloss fronted wall, drawer and base units with working surface over, integrated dishwasher and fridge/freezer, electric eye level double oven, built-in microwave, inset four burner gas hob with downdraft hob extractor, window overlooking the rear garden, smooth plastered ceiling with downlighters and smoke detector, vertical radiator and doors to sitting room and utility room. UTILITY ROOM: 6’6” x 5’2” Inset stainless steel sink unit with cupboard below, space and plumbing for washing machine and tumble dryer, wall mounted gas boiler, double wall unit, smooth plastered ceiling, radiator and doors to cloakroom and garden. CLOAKROOM: A modern suite with low level WC, pedestal wash hand basin, radiator, dimplex heater, smooth plastered ceiling and obscured glazed window. From the entrance hall stairs to first floor. LANDING: Airing cupboard housing Megaflo hot water tank with shelf over for linen, smooth plastered ceiling with smoke detector and hatch to loft. EN-SUITE SHOWER ROOM: Fully tiled shower cubicle, low level WC, vanity unit with tiled splashback, radiator, obscured double glazed window, Dimplex heater, electric shaver point and smooth plastered ceiling. BEDROOM 2: 11’6” x 10’ Radiator, smooth plastered ceiling and window to rear aspect. BEDROOM 3: 11’9” x 8’2” Radiator, smooth plastered ceiling and double glazed window to front aspect. BEDROOM 4: 8’ x 8’ Radiator, smooth plastered ceiling and window to rear aspect. REAR GARDEN: A paved patio leads to a good size lawned area with a shrub border along one side all enclosed by timber fencing. The garden then extends alongside the property to a pleasant seating area ideal for al-fresco dining and entertaining.